LED Bulbs last up to 10 times longer than traditional Christmas tree lights, they glow brighter and use up less energy. Multi-coloured, Red and Blue LED lights feature a control box to switch between 8 lighting modes: Waves, Sequential, Slo Glo, Chasing / Flash, Twinkle / Flash, Combination mode and Static mode. The white LED string lights are only available in Static Mode but come in a pack of 160 LED lights! 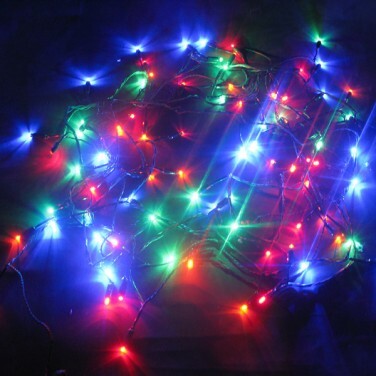 The cabling is green to help hide your string-lights on a tree and because LEDs work at low voltages, these lights are suitable for indoor and outdoor use. The LED bulbs can't be replaced but they have an expected lifetime of 100,000 hours so you shouldn't be fiddling with a bulb tester for a good few years anyway. Distance from transformer to first bulb: 10m approx. Length of illuminated cabling: 8m approx. Distance from transformer to first bulb: 5m approx. Length of illuminated cabling: 23.8m approx. * 8 flashing modes (Multi-coloured, Red and Blue LED lights only). * White LED string lights are only available in Static Mode.